JACOB BERANEK is a published composer, award-winning pianist, and dedicated enthusiast of Czech culture. He has been recognized with many honors for his work throughout the United States, and is currently serving as Composer-in-Residence for the ​Midsummer's Music Festival. Very grateful to Col Dr. Václav Blahunek and the Band of the Castle Guards & Police of the Czech Republic for their outstanding performance of my Památník: "Memorial" for Wind Ensemble in the gorgeous Spanish Hall of Prague Castle. Read the review in KlasikaPlus.cz (in Czech)! Honored to have spent two weeks in the Swiss Alps as a Composition Fellow at the Talis Festival & Academy in Saas-Fee, featuring the premiere my new quintet, Reveal. Thank you to Kara Reese Photography for many of the outstanding pictures seen throughout this website. After an exciting second season as the composer-in-residence of the Midsummer's Music Festival in 2018, featuring four performances of my Partita melodica, I'm already looking forward to next season. See you in the summer! Jacob developed a strong connection to his paternal heritage in the Czech Republic after doing extensive genealogical research on his family's roots. 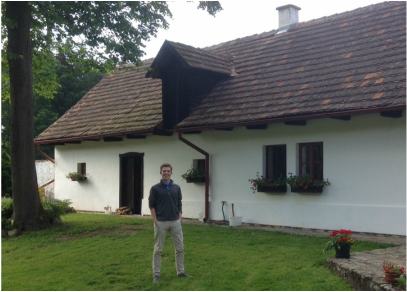 In June 2013, he traveled to Southern Bohemia to visit the Beránek family ancestral home (above). Jacob has had an undeniable love for Czech music since an early age. In fact, when he was just nine years old, he begged his mom to take a trip to Spillville, Iowa, so he could experience where his favorite composer, Antonín Dvořák, spent the summer of 1893. He traveled to the Czech Republic again in June 2015 and March 2017 to study piano and composition in Prague. Read more about Jacob's 2015 adventure in the Blog section.